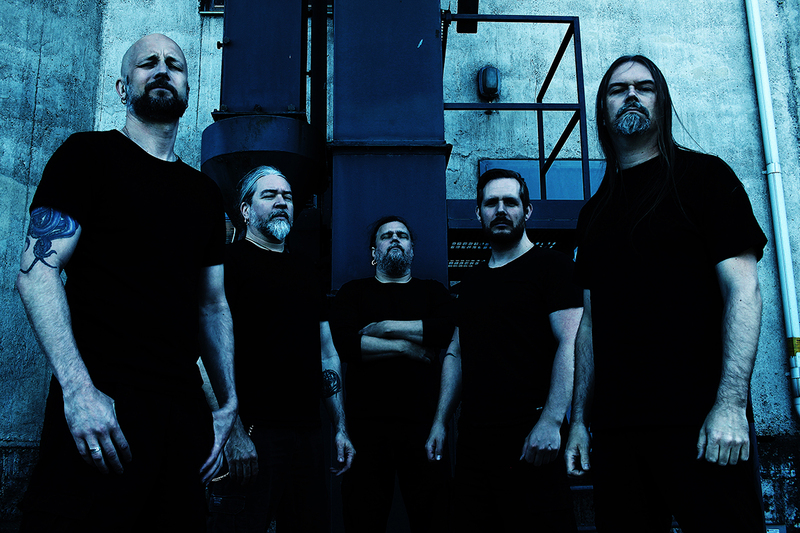 The recent Meshuggah album The Violent Sleep Of Reason (2016) was largely recorded live in a studio. As per their usual compositional method, the Swedish musicians sketch out a riff, rhythm or pattern using drum machines, sequencers and samplers. These composed micro-units are then appended to others, molecularly braided within metric patterns of cross-synching time signatures. The approach is machinic in the true sense: an elemental fuel (the riff) is inserted into a generator which outputs structured forms (the song). Those finger-tapped tattoos and hummed bass-lines replicate and self-procreate to produce echoes, versions, duplications and variations which are concreted into sonic mountains and aural canyons. The resulting soundscape is simultaneously molten and glacial: a hot throbbing blanket of bottom end and a chilling shower of high frequency shards. Like all Meshuggah records since Nothing (2002), The Violent Sleep Of Reason intensifies the tropes of Nu Metal by existing despite the music’s ostensibly impossible construction. The tracks’ micro-managed building blocks and their monolithic concatenations have been rehearsed and recorded as real-time performances. Two things are worth highlighting here. The first is that this mode of impossible composition has spurred Modernist music composition for over a century. From the timbral expansion of the orchestral palette to the gestural extension of instrumental technique to the graphic extrapolation of score manuscripts, the human composer has long sought how to generate maximal music beyond one’s means. Meshuggah — drawing heavily on the stupefying mathematics of bands like King Crimson (circa 1992’s Thrack) — channel this drive into the dialectics of metal and its myriad inflections. The second point is that while Meshuggah had to date mostly used digital tools to simulate this type of compositional complexity for their recordings, they only ever did so in order to confront themselves with the near-impossible task of physically performing such work in front of an audience, utilising the most traditional of tools: a drum kit, a bass guitar and two guitars with lots of distortion. In doing so, they have consistently promulgated an aggressive Ludditism predicated on generating maximal experiential effect. Seeing and hearing Meshuggah live is like having this intense proof-of-concept wrack your body. The sheer sonic assault of the band’s unique blend of frequencies is unavoidable. Snares and kicks crack like welding sparks, dancing atop an undulating field of bass frequencies. Unlike techno’s pleasurably relentless conveyer belt of discrete sub-sonic detonations and eroticised bass palpitations, Meshuggah’s refinement of hi-tech metal production constructs a dense merger of multiple lo-end bandwidths, coalescing into a unified yet layered meta-blob of noise. Bowel-massaging bass is felt from down-tuned eight-string guitar rumbles, muscular shuddering bass guitar throbs, and lingering booms of the kick and toms. With the superior mix and presence of their live sound on their March tour to Australia (lower in volume yet raging with more elemental presence than their previous tours here) their songs appear as architecsonic objects, like black diamonds being compressed from subterranean coal right before your ears. Their sound is a unified mass: it takes you nowhere, but rather stays in a fixed position, slowly rotating with tectonic gravitas. Words flail in attempting to effectively describe Meshuggah’s acoustic physics and its magnetic pull. Yet I remain convinced that the band’s focus on aural craftsmanship and their determination to amplify sensorial extremes are the prime factors in ensuring their live performance sculpts music in post-human guise. The resulting effect is so overwhelming it invites pleasure through our not being allowed into the music. I can’t think of any other band or performer who so fastidiously constructs music bent on repelling identification and access, yet at the same time inspiring awe through granting the listener a post-human experience. Meshuggah have long traded in post-human operations (boggling time signatures, impossible executions, abstracted musical grammar, alienating precision etc). Their live performances build a spectacular arena wherein a human audience is stimulated by a post-human performance predicated on dispelling every device employed to connect to an audience. For some this is preposterously arrogant; for others, it is absurdly self-defeatist. For me, it is liberating to witness such vibrant atonality born of a dark Schoenbergian Sabbath. The pleasure of music is often described in empathetic humanist terms as that which occurs when the listener surrenders to the music to attain ecstatic union. When Meshuggah unleash tracks like “Future Breed Machine,” “Bleed,” “I Am Colossus” or “Clockworks,” I feel like I have been vaporised into nothingness, obliterated in and by sound. This brings us to the sight of Meshuggah and their visual presentation on stage. The world tour promoting The Violent Sleep Of Reason features an elaborate lighting design by Edvard Hansson, who has been working with the band for over five years. Superficially described, it’s a brutalist onslaught of laser lines, bank flashes, tilting shafts and sweeping beams, all tightly synchronised to the cryptically encoded polyrhythms of the pummelling music. This type of hyper-synchro synaesthesia has long formed a tunnelling surge typical of Modernist progression: everything gets louder, faster, tighter, brighter, as if hurtling toward an ultimate point of cosmological fusion. The concept is interesting, but for over half a century this pursuit plots markers along the same linear vector, each competing with the other solely to be one node ahead. Lighting technologies for stagecraft (especially in the faux pyrotechnics of rock concerts) urge designers to charge along this vector, creating a glut of visual bombast that is pleasurable but tiresome in its lack of critical thinking in audio-visual assemblage and narration. 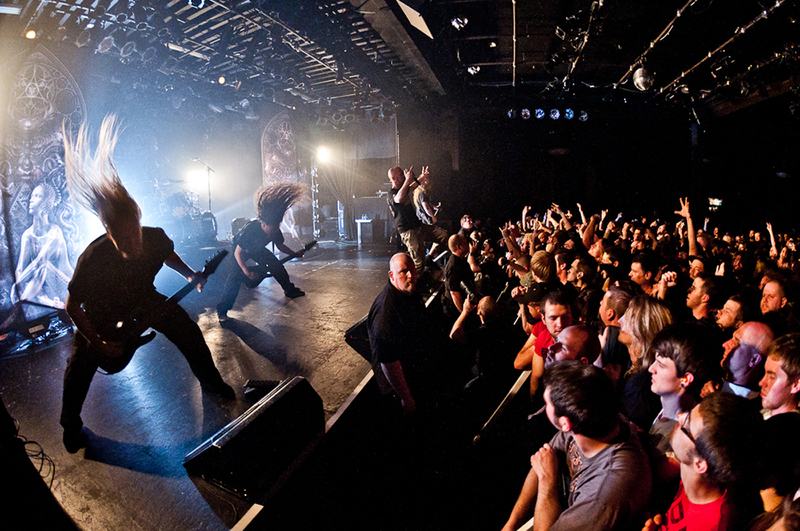 Conversely, Hansson’s lighting design proceeds from digesting the molecular and modular mechanics of Meshuggah’s compositional technique to produce a flashing, illuminated chart of how the music’s rhythms are energised by its interlocking logic. Think of it as a thousand nano signal lamps translating musical notation to simulate photic retinopathy. Standing in the audience, it is as if one is being pricked in a mysterious constellation of acupuncture points, matched to the drummer’s patterns and the other instruments’ blocking and forming. The amazing reveal is that Hansson is performing the light cues and their flashing with his fingers, manually tapping hieroglyphic tattoos in perfect synch with drummer Tomas Haake’s playing. For many, this reveal is astounding, based on the presumption that such complex lighting could only be programmed by MIDI authoring and computer processing (recalling that MIDI was employed in stagecraft in the late 80s, eventually transforming into MSC — MIDI Show Control — in the early 90s). But considered corporally and cosmologically, Haake’s hands control Hansson’s fingers, in turn triggering blasted light code signalling the ECG readout of the post-human corpus embodied by Meshuggah’s being. Thus the body, so the drum kit, hence the lighting. In a glut of Max/MSP/Jitter realisations, two humans synched by nerves and muscles power this audiovisual spectacle.